Tonight I had a delicious chicken dish with quinoa and steamed green beans for dinner. I love quinoa, because it gives me a lot of protein and fiber but tastes and looks like a grain (but is actually a seed). I found this very informative article written by Karen Railey on this fascinating food. I highly recommend seeking out quinoa next time you are in the grocery store or health food store. Be careful though, although “healthy” and ‘protein rich’ it does have its share of calories so use sparingly. “Quinoa (pronounced Keen-wah) is an ancient food that is not yet well known in North America. It has been cultivated in South American Andes since at least 3,000 B.C. and has been a staple food of millions of native inhabitants. The ancient Incas called quinoa the “mother grain” and revered it as sacred. Each year at planting time it was traditional for the Inca leader to plant the first quinoa seed using a solid gold shovel! Quinoa was used to sustain Incan armies, which frequently marched for many days eating a mixture of quinoa and fat, known as “war balls.” Beginning with the Spanish conquest in the 1500s, there was a 400-year decline in the production of quinoa. It became a minor crop at that time and was grown only by peasants in remote areas for local consumption. Technically quinoa is not a true grain, but is the seed of the Chenopodium or Goosefoot plant. It is used as a grain and substituted for grains because of it’s cooking characteristics. The name comes from the Greek words, chen (a goose) and pous (a foot). This is due to a resemblance of the leaves of the plant to the webbed foot of a goose. The leaves are lobed or toothed and often triangular in shape. The succulent like plant grows from 4 to 6 feet high and has many angular branches. The flower heads are branched and when in seed looks much like millet, with large clusters of seeds at the end of a stalk. The plant will grow in a variety of conditions but favors a cool, arid climate and higher elevations. Beets, spinach, Swiss chard, and lamb’s quarters are all relatives of quinoa. Quinoa grains range in color from ivory to pinks, brown to reds, or almost black depending on the variety. There are over 120 species of Chenopodium, but only three main varieties are cultivated; one producing very pale seeds, called the white or sweet variety; a dark red fruited variety called red quinoa; and a black quinoa. The seeds are similar in size to millet but are flat with a pointed oval shape and look like a cross between a sesame seed and millet. Quinoa has a delightful characteristic that is all it’s own: as it cooks, the outer germ around each grain twists outward forming a little white, spiral tail, which is attached to the kernel. The grain itself is soft and delicate and the tail is crunchy which creates and interesting texture combination and pleasant “crunch” when eating the grain. Quinoa has a fluffy consistency and a mild, delicate, slightly nutty flavor that borders on bland. The leaves of the Goosefoot (quinoa) plant are also edible and make a pleasant vegetable, like spinach. A quinoa leaf salad is generally more nutritious that most green salads. Before cooking, the seeds must be rinsed to remove their bitter resin-like coating, which is called saponin. Quinoa is rinsed before it is packaged and sold, but it is best to rinse again at home before use to remove any of the powdery residue that may remain on the seeds. The presence of saponin is obvious by the production of a soapy looking “suds” when the seeds are swished in water. Placing quinoa in a strainer and rinsing thoroughly with water easily washes the saponin from the seeds. In South America the saponin which is removed from the quinoa is used as detergent for washing clothes and as an antiseptic to promote healing of skin injuries. The quinoa seed is high in protein, calcium and iron, a relatively good source of vitamin E and several of the B vitamins. It contains an almost perfect balance of all eight essential amino acids needed for tissue development in humans. It is exceptionally high in lysine, cystine and methionine-amino acids typically low in other grains. It is a good complement for legumes, which are often low in methionine and cystine. The protein in quinoa is considered to be a complete protein due to the presence of all 8 essential amino acids. Some types of wheat come close to matching quinoa’s protein content, but grains such as barley, corn, and rice generally have less than half the protein of quinoa. Quinoa is 12% to 18% protein and four ounces a day, about 1/2-cup, will provide a childs protein needs for one day. The 6-7% fat of quinoa is relatively high when compared to other grains, but it boasts a low sodium content and also provides valuable starch and fiber. Quinoa also contains albumen, a protein that is found in egg whites, blood serum, and many plant and animal tissues. The seeds are gluten-free which makes this a nutritious and flavorful alternative grain for those with gluten sensitivity. Quinoa would be a worthy addition to anyone’s diet, supplying variety as well as good nutrition. The seed is also excellent feed for birds and poultry and the plant itself is good forage for cattle. Cooked quinoa is excellent in hot casseroles and soups, stews, in stir-fries, or cold in salads. The seeds cook very quickly, in only 15 minutes. Uncooked seeds may be added to soups and stews as you would barley or rice and quinoa is often substituted for rice in rice dishes. Dry roasting quinoa in a pan or in the oven, before cooking will give a toasted flavor, and it can be cooked in fruit juice to add character to the flavor for use as a breakfast cereal or in desserts. Cold salads consisting of quinoa and chopped vegetables or cooked beans make a quick, easy, and nutritious dish. Quinoa flour is used in making pasta and a variety of baked goods such as pancakes, bread, muffins, and crackers. Quinoa seeds can be sprouted and eaten as raw, live food for snacks or in salads and sandwiches. To sprout the seeds, soak about 1/3 cup seeds in a jar for 2 to 4 hours, then drain and rinse the seeds twice a day for 2 to 4 days. When the sprouts are about 1 inch long, place them near a window for chlorophyll to develop, which will give them a vibrant green color. Another fascinating way of using quinoa is to “pop” the seeds in a dry skillet and eat them as a dry cereal. To remove the sticky, bitter tasting saponin that may still cling to the surface of the quinoa, place in a blender with a couple of cups of water. Pulse motor on and off a few times, until the water becomes cloudy. Repeat with fresh water until it stays clear. Strain quinoa through a fine-mesh strainer, discarding the water. Set aside. Heat olive oil in a medium saucepan. Add garlic and shallots, and saute until translucent, about 3 minutes. Add the quinoa and continue to saute for about 5 minutes, until grains appear toasted. Add the broth, cover, and bring to a boil. Reduce the heat and simmer slowly for about 12 minutes, until all the liquid has been absorbed. Fluff the quinoa with a fork. Stir in bell pepper, parsley, salt and pepper. Dry the lid. Crumble a paper or clean kitchen towel and place over the quinoa. Cover and let stand for 5 minutes before serving. Calories: 212, protein 7 grams, Fat 7 grams, Dietary Fiber 3 grams, Sodium 68 mg, Calcium 45 mg.
Quinoa, a super food from South America, is packed with protein and fiber. Toasting it gives it a slightly nutty taste, a complement to the walnuts and a foil to the lemony tarragon dressing. Try this salad over greens of any sort: fresh arugula, Boston lettuce leaves or wilted spinach. 1.Toast quinoa in a dry skillet over medium heat, stirring often, until it becomes aromatic and begins to crackle, about 5 minutes. Transfer to a fine sieve and rinse thoroughly. Meanwhile, bring broth to a boil in a medium saucepan over high heat. Add the quinoa and return to a boil. Cover, reduce heat to a simmer and cook gently for 8 minutes. Remove the lid and, without disturbing the quinoa, add edamame. 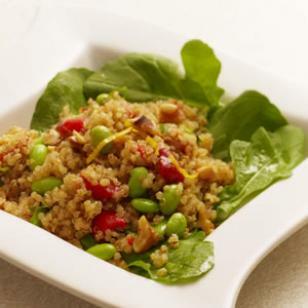 Cover and continue to cook until the edamame and quinoa are tender, 7 to 8 minutes longer. Drain any remaining water, if necessary. Whisk lemon zest and juice, oil, tarragon and salt in a large bowl. Add peppers and the quinoa mixture. Toss to combine. Divide among 4 plates and top with walnuts.